This is part of the documentation of the Infragram Point & Shoot but also applies to any Mobius Action Cam settings you want to change. One step you need to take to set up this camera is to configure the white balance; otherwise, your images will be flooded with infrared and will look pinkish -- and the NDVI post-processing steps (see NDVI) and https://publiclab.org/notes/warren/10-20-2017/getting-started-with-infrared-photography-on-infragram-orgthis activity won't work. If your camera did not ship with a config file or you are using a new SD card, follow these steps to get your Infragram Point & Shoot to take properly white-balanced images, necessary for post processing at Infragram.org. This is also relevant for anyone who has a Mobius Action Cam and wants to script or customize its settings. The config file may also be used to set up Timelapse Mode -- see the Infragram Point & Shoot activities for timelapse setup. Note: The white balance setting in the config file should be "7" but occasionally we've found that some cameras require an "8" -- if you have trouble, please leave a comment here or post a question. replace the generated config file with this one in the home directory: SYSCFG.TXT or SYSCFG.TXT for a 2-second timelapse mode. repeat turn on pressing mode. There's a good question posted by @abdul on what settings are the best for doing NDVI ( #ndvi) and while the above config file should work, there may be better settings to use; please post feedback in the that question and we can update the config file here accordingly if we find a clear improvement in a different configuration! At step 3, you can alternatively, you can also edit the file yourself. If you choose to edit it yourself, you can do so first by changing the default mode of the camera at the top of the document. Where the text reads Default Mode = change the 0 for a 2 -- Mode 2 is picture mode. Next, scroll down to the paragraph that begins, "Enable Manual AE Lock or AWB Lock." In this paragraph you will find a line that begins White Balance = and again, you can change the white balance to 5, 6, or 7, which are all custom white balance 1, 2 and 3 respectively. Lower down, you can see the area where you set the custom white balance by changing the gain values for red, green, and blue. Community members have found (discuss this here) that values of about 250 for red gain, about 500 for green gain, and about 900 for blue gain are ideal. Set the gain values in your custom white balance, and don't forget to set the white balance to the your new custom value. From here, you can save your work and continue! 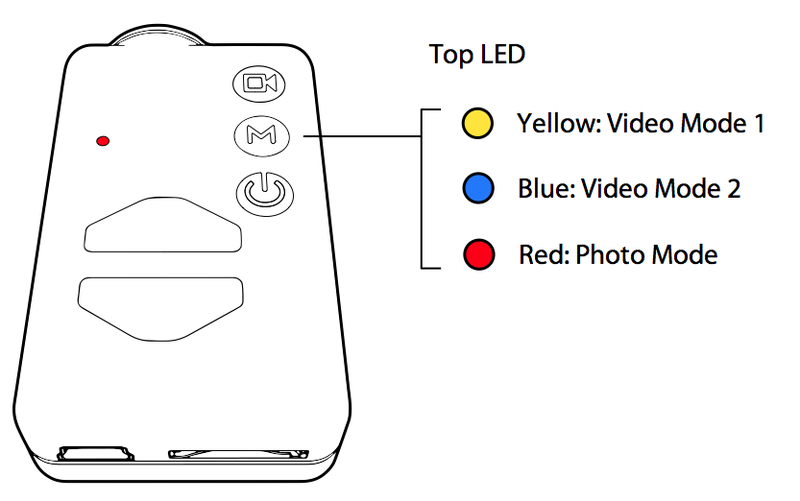 Place the SD card back in the camera and this time hold BOTH the power button and the mode button until the LED flashes red. You will have to hold the two buttons for notably longer than you had to hold the power button last time, as long as 7 seconds, before the LED begins to flash red. These files are not extremely complicated and can be manipulated by you at any time. If you find a configuration that is more optimal than ours, please post a response here. We rely on community members like you to help improve these tools!